Protex World Convertible Soft Top Canvas Restorer Black 500ml. Specially formulated to rejuvenate your faded canvas soft top, this colour restorer will produce a strong and even finish, penetrating deep into your canvas top. This product will keep your roof looking like new and is easy to apply giving unbelievable results. Suitable for the auto detailing of all types of soft top, ragtops and tonneau covers. Can be used for new and classic car detailing. For over 20 great Protex World product demos please type Protex World into You-tube. Specially formulated to colour restore your faded canvas soft top this colour restorer will present a strong and even finish penetrating deep into your canvas top. 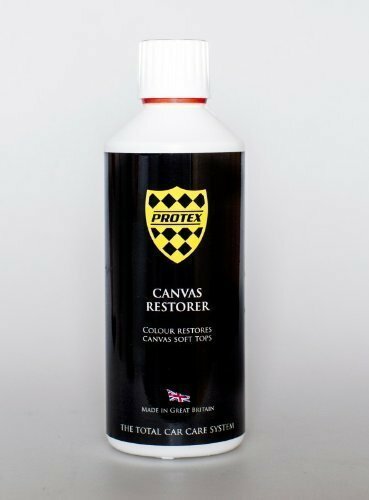 Used after Protex Canvas Cleaner, colour restoring your top is the second stage in the Protex soft top restoration process. Application: - It is recommended that approximately 500ml of product is sufficient to restore a top for a 2 seater car. It is best to apply the product in cool/overcast conditions so that drying time is not too fast and to avoid causing an uneven finish. Shake the bottle well and decant sufficient product into a separate container to apply to the soft top. Then start at the centre and work outwards apply the restorer quickly and evenly with a clean paint brush taking care not to spill any onto the vehicles paintwork. Leave for 3 hours to allow the restorer to dry and if required recoat and again allow 3 hours drying time. Do not expose to moisture until the restorer has completely dried. It is recommended that the canvas is then sealed and protected using Protex Canvas Waterproofer. Testimonial - "Really great products. They all worked perfectly in restoring my convertible hood to look like new again. Very easy to use and they did what they said they would. Follow the instructions and you should get great results. I had enough of each of the products to do a standard size convertible top. The waterproofing now beads in the rain like the polish on my paintwork. Very happy."